“Science” in quotation marks because we aren’t scientists here and want to give you the layman’s, quick version behind all of this. Long explanation short is we all know hair color/lightening processing (bleach AND hair color) can and, frankly, does damage the hair to some degree. The ‘bonds’ broken down in the hair strand during a color processing can weaken it and therefore cause breakage. We accept this as a ‘risk’ associated with hair color and obviously with a trained stylist who knows how to formulate correctly they can give you a service that limits this from occurring, however, the breakage/damage still does happen. Product development companies started studying this bond breakdown and what we can add to the process to prevent it. Hence bond builders were born. WHAT DO BOND BUILDERS DO? Added to your hair color or lightener, a bond builder can restore already broken bonds in a hair shaft and are supposed to protect the hair from damage. Again, layman’s terms here. Ok let’s get to the good stuff already. 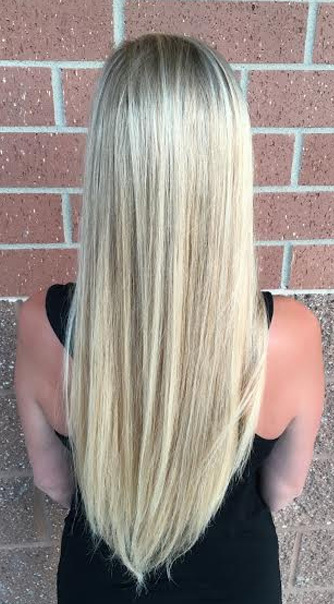 In our case study, we used the Uberliss Bond Treatment on a model with, needless to say, mermaid long hair. Needing to pull the lightener through the entire strand to get the lift she wanted, we added in the Uberliss Bond Regenerator to lightener using a 20 volume developer. Yes, we could have used a higher developer in theory but given the amount of hair this model had and the fact that we needed to pull the formula all the way through, well, if you’re a stylist you’ll understand there’s no need in this instance to go higher (timing and integrity are everything). The model’s entire head was foiled and once done the last foils took approximately 25 minutes to process without using heat. We didn’t feel that adding in the Bond Regenerator to the formula delayed the processing at all (as it says it shouldn’t), this is a pretty standard amount of time to get to the level (pale yellow, of course) we wanted. 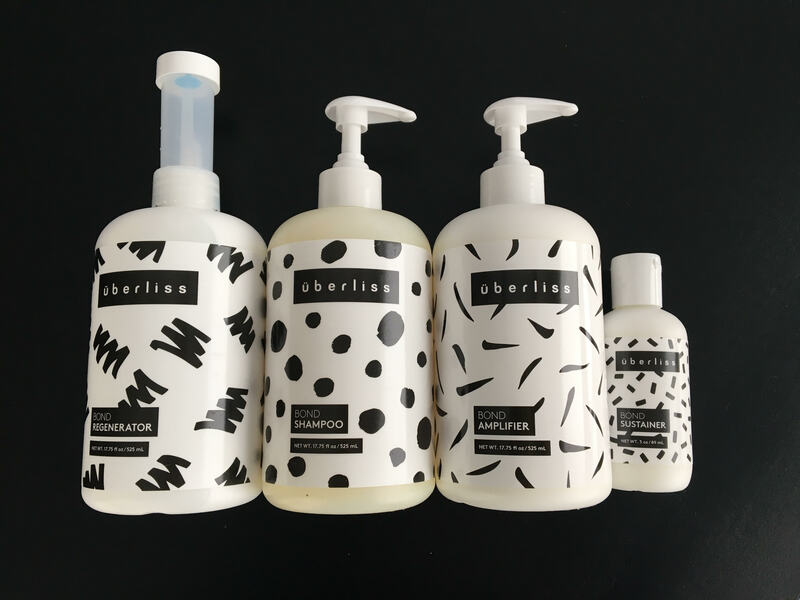 The Uberliss system also comes with a Bond Shampoo and Bond Amplifier (Conditioner) that you use during the service at the bowl. Rinse with the shampoo and condition with the Bond Amplifier, leaving it on the hair for 10 or more minutes. The amplifier conditioning treatment uses the same bond compound as in the regenerator and further seals the bonds in place, reducing damage. Stylists can send their client home with the Bond Sustainer conditioning treatment to use once a week as well. From what you can gather via the photo, we obviously achieved a high level of lift to the icy, platinum blonde shade we were going for. 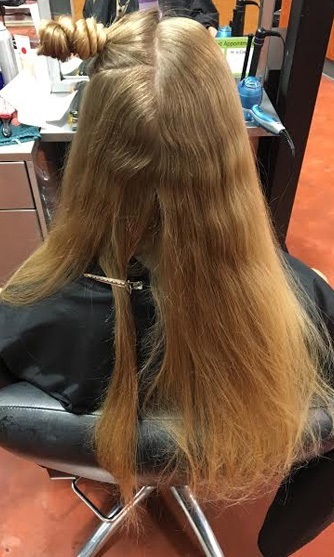 When someone has this long of hair and wants to be as light as possible, there’s a reasonable risk that when you’re pulling lightener through the ends, on the ‘older’ and more susceptible to damage part of the hair, you can see breakage happen very easily. Using a bond regenerator in this scenario should really not even be a no brainer but rather an essential to part of the service. The Uberliss Bond Treatment really does showcase the ‘science’ behind their formulation quite well. They did lab tests on elasticity, porosity, and surface imaging to back their product and the results are, well, fascinating if you’re in to actually seeing results. 😉 You can read more (and see the visual proof) about the science behind the Uberliss formulation on their website here. 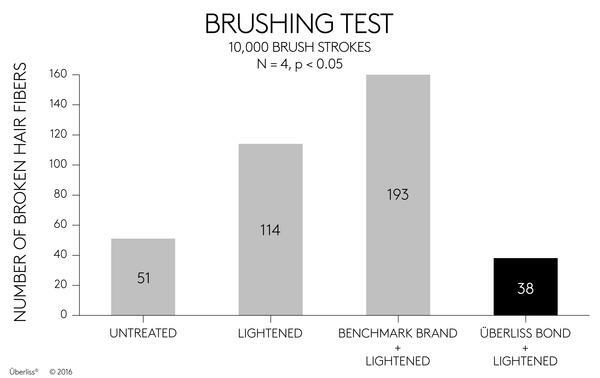 Most notably is how the Uberliss Bond Treatment stood up against a brushing test on even UNTREATED hair. It performed better. Game changer.